Last week I successfully completed my transaction with over-drive-inc. 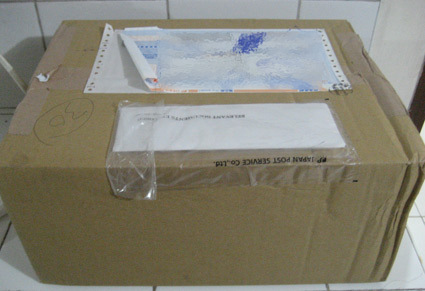 I have to say that I was satisfied with the quick processing of my order and the next day shipping. It took only two days for them to process my order then send it out. Along the way I would get updates via email as to the status of my order: "processing to shipped". Two weeks later the order arrived for me to pick up at the post office. My items came in a nondescript box. Which is how I like my mail to be packaged. The reason being is that it doesn't raise any unwanted attention at the post office, where things are known to get lost if they look enticing enough. This is where I like Overdrive over Hobby Link Japan. When Hobby Link Japan's box came it had markings of the HLJ logo and a link to the site, I wish HLJ didn't advertise at my expense. Inside you could see that they didn't scrimp on the packaging, because they wrapped my items around some bubble pack. When ordering at Over Drive Inc, they charge you right away for your item, unlike some stores that get back to you with the total price. This also holds true when you pre-order something from them. Nice too that they offer payment via paypal. I liked the account interface as it is simple to understand and use. I also like the fact that they use SSL during your transactions and user account updates. The individual product page of each item is good since they are generous with the pictures shown. Descriptions however are so-so as most of whats written there pertains to payment and shipping policies. I wish they would show the dimensions of the box and the item in the product page. Can't understand however why the product description is provided in PDF form. I think that the product display page could be improved further by being able to sort by series, scale and maker. 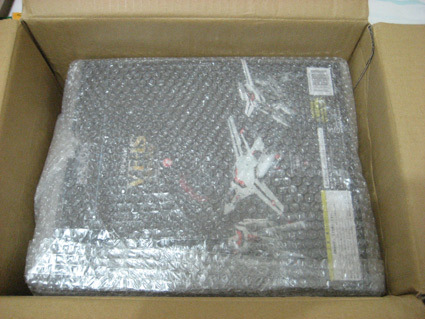 I ordered a 1/60 VF-1S of Hikaru Ichijo from DYRL. Because of the price of the item the only shipping option given to me was via EMS. No worries on my part. When shipping you can ask them to declare the item at the post office in the way that you like. This comes in handy when you are buying a gift for another person and having it shipped to their location. I heard that declaring it as a gift means that customs tax will most likely be waived,... most likely. This comes in handy too when you bought it during a sale. Some thing you have to remember is that canceling an order bears a transaction fee to a certain extent. I notice that this is common practice for online export stores in Japan. Stuff that I wish that they improved on was offering a loyalty system to their customers like some sites do in the form of discounts or points. But then again, the reason they're probably not doing this is so as to keep the prices of items low. Or maybe an affiliate program for webmasters... hehehe... but then again, even without that, it wouldn't stop me from showcasing "sale" items of theirs on this site. For instance, check out the 1/60 Macross toys by Yamato on their site, because some of them are with bargain prices. I like also that you have an option to receive news from them in your email so you can keep tabs on their specials. One thing I noticed is that they can also carry stock of some Macross exclusive items. Stuff that aren't normally bought off the shelf but have to be ordered if you are a club member. Like the Bandai 1/60 VF-25 Armored Alto version. I noticed that their inventory seems to focus on just toys and figures. I wish they would also cater to the scale modelling crowd. I was looking for some Gundam model kits but seems like they don't stock any. I'll definitely come back to them in the future for my orders.